All our figures are based on the product emitting 70% of its initial lumen output (ie when new)after the stated hourly rated lamp life. Colour appearance & colour temperature. The most common terminology is to classify colour temperature as one of three options. These being warm white (approx 3000k), natural white (approx 4000k) and cool white (approx 5500k). This is a figure that indicates the accuracy of the reflective surface colour of an object when subjected to artificial light. For example an object in daylight on a reasonably sunny day will be subject to a CRI of 100 from the light source, which in this case would be daylight, the sun. Theoretically the colour of an object will be 100% true. Once the same object is placed into a dark room and a light fitting with a CRI of 85 is illuminating it, then the colour of that object will be 85% of its true colour. Therefore the higher the CRI, the more accurate the colour. Colour temperature has a bearing on this as a white object would appear “yellow” if illuminated by a warm white light source. Careful consideration has to be taken to ensure that the correct type of light with the correct CRI & colour temperature is selected for any given installation. CRI of 80 is the minimum standard. This relates to the amount of light (lumens) emitted from a light fitting in relation to the amount of power it uses to create this output. 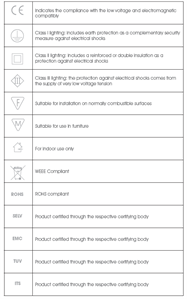 There are now regulations in place that state minimum lumens per watt criteria and any lights that do not conform aren’t able to be used in certain applications. Advice should always be taken to ensure that the correct lighting is used on any installation. The cone diagrams associated with each light show the expected lighting level at a measured distance. These may vary dependant on surrounding surfaces and colour. The beam angle of a light fitting allows the installer to determine the spacing of light fittings as to achieve the most uniform, consistent lighting onto the desired area. From the 1st February 2013 minimum energy efficiency requirements for directional lamps and LED lamps came into effect (EG 1194/2012). 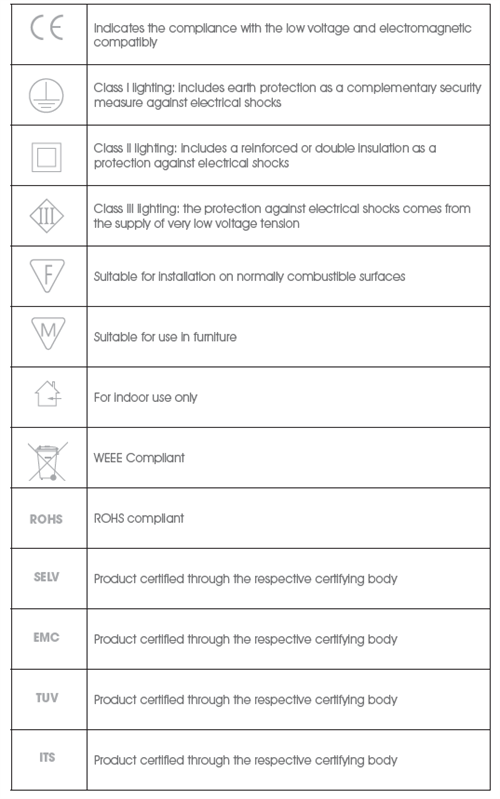 Furthermore the energy labelling for lamps was newly regulated and broadened in scope and was introduced for luminaries form the 1st march 2014 (EG 874/2012).